Animals can match their background to avoid detection by predators. For instance, numerous species have evolved color patterns that help them blend into their surroundings and avoid predators—a phenomenon called crypsis. 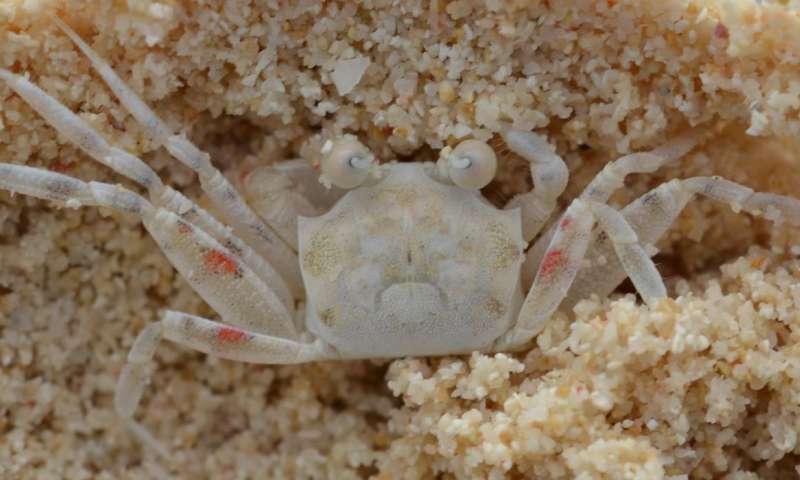 A new experimental study found that ghost crabs in the Solomon Islands may achieve crypsis by actively choosing to live in sand background that matches their body color. Work by biologists from the University of Miami shows that crabs with dark coloration choose dark sand while crabs with light coloration choose light sand. Crabs of intermediate color show no specific choice, as they did not match either sand. "In nature, it is common to see animals match their background, but in many cases we don't know if this is through active choice, a change in color, or a combination of these two," said Dr. Floria Uy, lead author of the Biotropica article. "Our study shows that these crabs are actively choosing match their sand background." The results have implications in understanding the evolution of anti-predator adaptations.